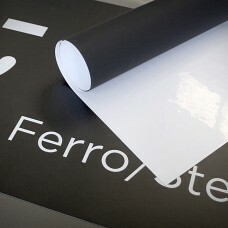 New digitally printable HD Ferro (Steel film) which has no magnetic attraction itself but is attracted to magnets and will adhere onto a magnetic board. Faster, lighter, cheaper and easier! PET HD Ferro material (magnetic receptive material) is white PET one side for great q..
HD Ferro PET material (magnetic receptive material) is white PET one side and black f..
PP HD Ferro material (magnetic receptive material) is white PP one side for grea..
HD Ferro PP material (magnetic receptive material) is white PP one side and blac..